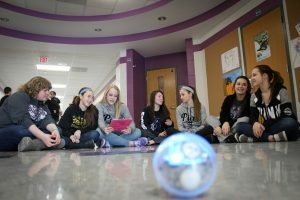 WASHINGTON, April 27, 2017 /PRNewswire/ — National Education Foundation (NEF), the non-profit leader in K-12 STEM Solutions, and QZAB funding for schools announced today that Martins Ferry City Schools, Ohio, has won the $10,000 NEF 2017 National STEM Leadership Award. Martin Ferry’s STEM+ (STEM, Reading, Social Studies, SAT/ACT, CTE, IT, Business, Soft Skills) Academy is funded by the federal QZAB program, with a significant NEF matching grant – as mandated by law. NEF has given over $200 million in such matching grants since 2000. Martins Ferry students advanced a grade level in math and reading in 29 and 27 learning hours, respectively — a phenomenal achievement, according to NEF’s academy partner, the State University of New York (SUNY), the nation’s largest university. SUNY evaluates student performance weekly in all NEF-SUNY STEM+ Academies. The Award ceremony will take place at Martins Ferry on May 19, 2017. NEF provides funds and services to create a holistic STEM solution consisting of three critical elements — 1. Academic via personalized learning mapped to every state’s standards, 2. Application through STEM contests with prizes up to $50,000, and 3. Hands-on programs such as robotics. See the video to learn more about NEF-SUNY STEM+ Academy programs. Martins Ferry’s success stands out as a clear example of how to cost-effectively improve student achievement by involving and motivating all the stakeholders—students, teachers, parents, and administrators. NEF-SUNY STEM+ Academies motivate stakeholders by providing teacher stipends, student cash awards, and teacher & parent training. School districts in Canton, NY, Lehighton, PA, Steubenville, OH, and Warren County, PA, are also being recognized with STEM Merit cash awards by NEF. In addition to these annual awards, NEF provides 80 to 100% STEM grants to disadvantaged school districts/schools nationwide. Through the QZAB, STEM+, and Adopt-A-School grant initiatives, NEF has created the most cost-effective, high-quality STEM+ education solution in the U.S. See www.stemgrant.org. With Academies in 20 states and several major cities, NEF’s goal is to provide STEM+ education to students in most disadvantaged schools in the U.S. by 2020.